Just as you wouldn’t try to plant a flower in concrete… a rock hard, compacted soil bed is not conducive to a great lawn either! Whether or not you are over-seeding this year, loose soil allows grass roots to plunge deeper into the soil to find vital water resources in times of stress. Thatch is made up of grass stems and roots that accumulate faster than they breakdown. Excessive thatch creates an environment that is favorable to pests and disease. By penetrating the soil, you’re allowing moisture, air, food (fertilizer) down to the root zone where nutrients are absorbed. Grass seeds germinate easily in aerator holes as the holes provide them a place to hide. Grass seed must be in direct contact with topsoil to germinate and will not germinate in thatch. 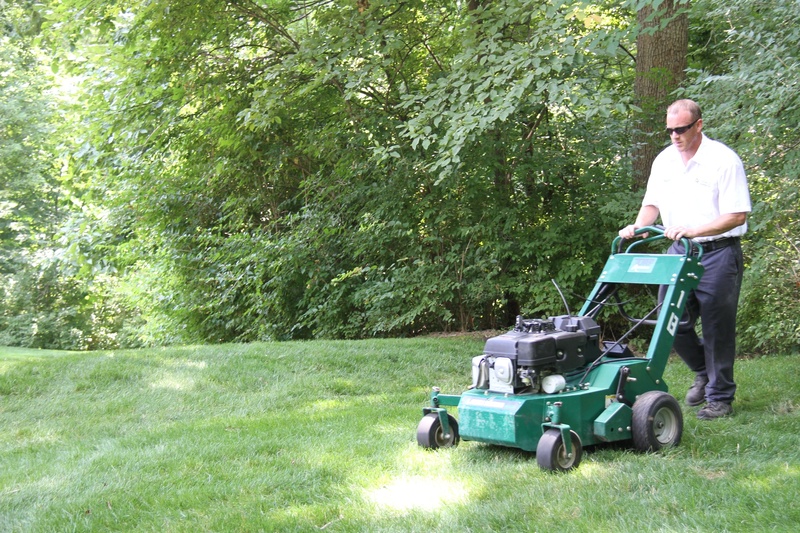 Dowco’s aeration prices start at $95 and we offer bundles for overseeding at the same time. Single aeration – chosen by budget conscious property owners who understand the importance of aerating yearly, but do not want to add seed. If you are seeding your lawn, one pass is usually not enough. Double aeration – the standard option for Dowco. With the purchase of seed, you’ll be upgraded to a double aeration for the price of a single. Triple aeration – for heavily compacted soils, new construction properties, or lawns that haven’t been aerated in 3 years a triple aeration is a must. Alternatively, you could rent an aerator machine from a local home improvement store and DIY. They have small power aerators that you can push or options that you can tow behind a tractor. It is popular for homeowners to share the cost with a couple neighbors and rent an aerator together for the weekend. It’s a very popular time to rent this equipment so make sure you reserve early. Unfortunately, wearing golf spikes and walking in your lawn is not an alternative to aeration. The less than ½ inch spikes aren’t long enough to penetrate the soil and reach the roots. Fall is the best time to amend your soil and improve the condition of your lawn. In addition to aerating this fall, many property owners consider overseeding and compost topdressing. Interested in learning more? Ask our team of the best lawn care experts for more information and pricing for your triple lawn aeration, seeding and composting this fall.